SpinalCure Australia has awarded a prestigious Career Development Fellowship to Dr Marc Ruitenberg, a lecturer in Neuroanatomy & Neuroscience at the School of Biomedical Sciences and Affiliate Research Fellow of The Queensland Brain Institute at The University of Queensland. This award is being funded in partnership with the University of Queensland for the 2012-2015 period. Dr Ruitenberg received his research training in the Neuroregeneration Laboratory of Professor Joost Verhaagen at the Netherlands Institute for Neurosciences in Amsterdam. 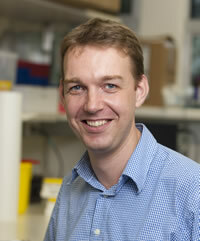 Following the award of his PhD in 2003, he moved to Australia where he continued his research into nervous system injury and repair strategies. The focus of Dr. Ruitenberg’s current research is on the inflammatory response that is associated with neurotraumatic events, specifically spinal cord injury. There is overwhelming evidence that the induction of inflammation after spinal cord injury is harmful although it is increasingly recognised that certain aspects of the inflammatory response are also necessary for tissue repair. The ultimate goal of his research is therefore to advance our understanding of which aspects of the inflammatory process worsen injury outcomes. Dr Ruitenberg explains that generating these insights is critical for the development of new and effective anti-inflammatory therapies that can improve recovery. He is concentrating the research efforts of his laboratory on the innate immune system because of the dominant role that it is thought to play in the inflammatory pathology associated with spinal cord injury. His laboratory is also actively involved in the development of ultra-high field magnetic resonance imaging (MRI) techniques to aid better translation of promising research findings from the laboratory bench to the clinic. Dr. Ruitenberg said that the award of this Fellowship is a major boost to the research activities in his lab and will accelerate the development of better treatment options for spinal cord injury.